Dental implants just aren’t one of those things that many people know a lot about. But, it is something you may need to know about in the event you lose a tooth, which could be for any number of reasons. Dental implants have been around for decades and, if you want to get technical, they have actually been around since ancient man. Regardless, when it comes to caring for your pearly whites (and finding replacements for any that you may have lost) you will want to be well informed of your options, including the dental implants cost. Learn the facts about dental implants to determine if they are the right choice for you. Dental implants are an ancient practice. The first implants date back to 600 A.D., when tooth-like shell pieces were hammered into the jaw of a Mayan woman. Other civilizations used other human or animal teeth held in place by gold rings. Modern dental implants have been used in practice for more than 20 years and rank among the most successful surgical procedures with a majority of outcomes lasting throughout the lifespan of the patient. Approximately 69 percent of Americans age 35 to 44 have lost or are missing at least one tooth due to accident, disease, or aging. Dental implant candidates must have good oral hygiene and be in good health overall. Certain diseases and conditions can impact healing or success of the implant, making review of candidacy a careful process. 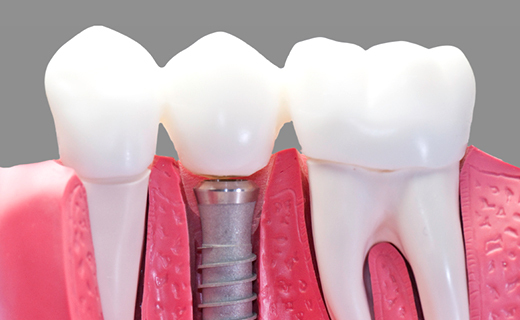 Most dental implants use biocompatible titanium to replace the root of the missing tooth. This metal provides a strong and durable support for replacement teeth or crowns. Dental implants are not susceptible to cavities. Although tooth decay is not a possibility, twice-daily brushing, once-daily flossing, and routine visits to your dentist in Westminster are essential to protecting and preserving surrounding natural teeth and gums. Expert dentists in this type of procedure are credentialed by the American Academy of Implant Dentistry (AAID). Choose a dentist in Westminster who is experienced in dental implants when deciding which treatment options will meet your long-term needs.